Should athletic organizations punish players for acts of deviance and violence? Athletes should be liable for deviance and violence. The punishment should not be based on whether the violence and deviance were against the organization or an individual from outside the sports. All deviances by the athletes should be treated the same way as a person outside the sports environment would be punished. The main reason why the athletes should get punishment is that sports are supposed to promote a great deal of socially desirable characteristics. Some of the characteristics include compliance to the authority, fair play, hard work and dedication towards achieving the desired goals (Delaney and Madigan 174). An athlete could violate the fair play by using performance enhancement drugs. The act is usually punished by suspension or any other punishment stipulated by the organization they work. Deviance on compliance with the authority is punished within the organization, and if the violation goes against the rule of the law of the land, the punishment is taken up by the department of justice (Delaney and Madigan 217). A breach like that of Ray Rice runs counter to the regulations of the law of the land hence the reason why it was taken up by the department of justice. 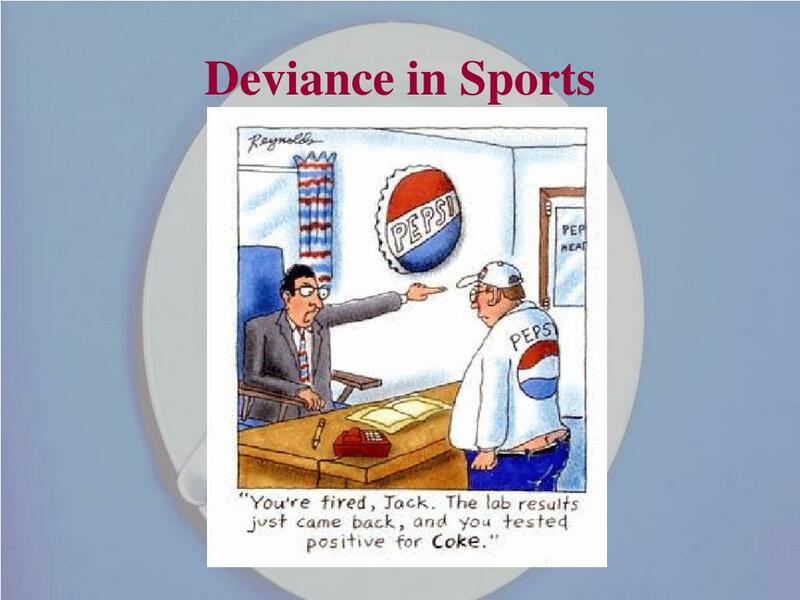 Deviance puts the efforts and the good name of sports industry at jeopardy which should not be allowed. The other reason is that some deviances are a violation of human rights. For example, the case of Joe Mixon and that of Ray Rice, the two women were violated, which is against the fundamental human right ("Football Star Punches Woman In The Head - CNN Video"). The cases are an example of domestic violence which the country is fighting. Letting the violators off the hook on cases like this only shows unfairness in the society and special treatment of people just because they participate in the sports. The act would also breed a bad behavior among the sports men. Punishment prevents future happenings of the same hence cultivating the good reputation of sportsmanship. Does it depend on the specific act? As at the moment, the punishments of deviance are dependent on the deviance itself. For example, when Ray Rice violated his then fiancé, the organization he was working with was reluctant punishing him because he did not do anything that affected his relationship with the team. It is, in fact, the media that forced the hand of the NFL into suspending him indefinitely. The same could also be seen in the case of Joe Mixon. However, when the player violates anything that puts the team in jeopardy of losing the game, the organizations are quick to punish the player as it affects the organization directly. The act was seen when Josh Gordon failed the drug test. The discussion on whether to trade him begin (Should Browns Keep Or Trade Josh Gordon?). It is a double standard that the sports organization are quick to respond to a defiance against the organization than those against the environment outside the sports. The response to deviance should always be the same. The act should not matter because the individual has committed a violation. What should matter is the punishment one receives. The determiners of punishment and its severity. The department of justice should determine the punishment. In the past, organizations running the sports have opted to resolve the issues internally. However, in some cases, the situation has gotten out of hand hence forcing them to involve the department of justice. It is general knowledge that violation of the law of the land is also a violation of the rules of the sport and vice versa (Delaney and Madigan 217). Therefore, it would be only prudent to allow the department of justice to handle the situation, rather than making it the last resort when the organizations can not contain the situation.